Most cycle tourists take out some kind of travel insurance before they set out and probably check that it does not exclude what they are doing, where they are going or for how long (which is often an issue with cycle touring). They may also check that it covers all medical expenses and repatriation etc. If it ticks all these boxes then they generally forget about it until the next holiday when they go through the whole procedure again. But what happens if you suddenly need to use it? This happened to me on our last trip and things did not go at all as I expected. Luckily we had two types of insurance. We had the emergency rescue insurance through our DeLorme Inreach Explorer (www.inreachdelorme.com). DeLorme were not only able to receive our SOS from a remote area of the Canadian Rockies where there was no telephone coverage but were able text us to find out what was wrong, they knew where we were and got a helicopter (www.bighorn.ca) with medics to us within an hour and a half. They also allowed it to return on a separate trip to collect my husband. Money was never mentioned, it was just covered, no worries. Great service! After that it was a different story, and despite clearing all treatments with our insurance company’s Canadian helpline first, 9 months later our insurance company, StaySure (www.staysure.co.uk) has still not reimbursed us one penny and we are still filling in forms. Much to our surprise, in Canada the hospital doctors and ambulances will not accept payment from insurance companies, you have to pay them at the time and claim it back. Only the hospitals would accept our insurance details, and even then our insurance company has taken so long to pay them that we have had to pay these as well so we did not have a legal case brought against us. We were lucky we had not yet crossed the border into the USA or the bills would have been much higher. This got me wondering how many of the young cycle tourists we met cycling The Great Divide, generally on a shoe string, would have been able to afford this. I would suggest you ask your insurance company about this before taking out their insurance. The other problem was that I was the person who arranged all our insurance and had all the details on my computer. At the time of the accident I had no idea what was going on, I have no memory of that week and for a long time afterwards could not remember any of my computer passwords! Luckily I had emailed Bernie a copy of the insurance before we started, but this is something to consider if you share out tasks before a trip. Also, it may pay to give some thought about how you would cope if you have an accident in a remote place. I was lucky that I was with someone, but many people cycle alone. You may need some medical knowledge if help is not close at hand. As we had been planning on cycling in some remote spots we both went on a Far from Help emergency medical course run by Wilderness Medical (www.wildernessmedicaltraining.co.uk) where we learnt how to staple, sow and stick each other back together as well as dealing with broken limbs and other injuries. Luckily Bernie got higher marks than I did and the hospital said that it was the best field dressing they had seen, although I was glad he left the sowing (6 stitches) to the hospital! Obviously, as we were evacuated by helicopter we could not take our bikes or panniers with us. When I was taken first he made sure that I had money and my insurance card with me. At that time he did not know if the helicopter would come back for him, and he was left to deal with 2 fully loaded touring bikes a days ride from the nearest tarmac. Once he knew they were coming back he hid the bikes and panniers and had to leave them behind. We were lucky as one of the paramedics kindly drove out to get them and kept them in his garage for us. Canadians are just great. 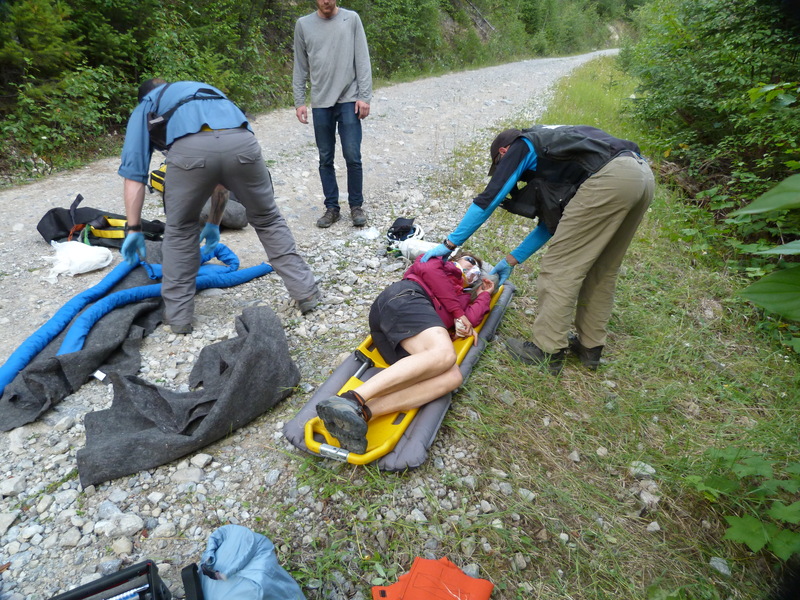 I was lucky, and despite severe concussion, a broken thumb and a lot of bruising, we were able to continue our cycle trip along the Great Divide to Mexico, but only after many visits to specialist hospitals spread between Fernie and Calgary. More expense! In future I will be reading the insurance details much more closely.